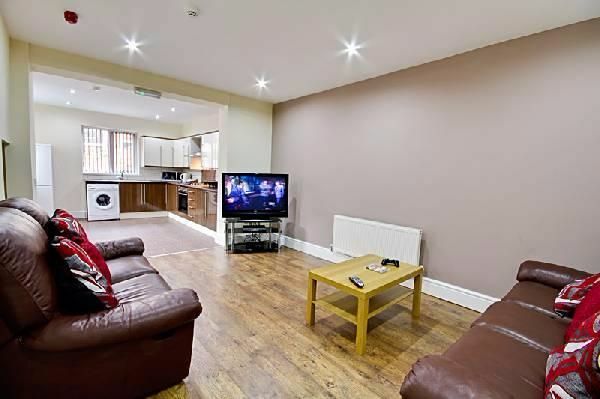 Kingswood are delighted to offer this 1 Bedroom in a 6 bedroom student accommodation to let. The property comprises of inviting hallway leading to spacious open plan lounge to fitted kitchen which includes fridge freezer, washer/dryer, and microwave. The lounge comprises of sofas complete with dining table and chairs. On the ground floor there is one double bedroom consisting of beds, wardrobe, study desk and chair. On the first floor there are further three bedrooms again all consisting of beds, wardrobes, study desk with chair. There is a four piece bathroom complete with bath &amp; shower and a separate w/c. On the second floor there is another 3 piece bathroom along with two further bedrooms complete with double bed, study desk and chairs. Property descriptions and related information displayed on this page, with the exclusion of Running Costs data, are marketing materials provided by Kingswood, and do not constitute property particulars. Please contact Kingswood for full details and further information. The Running Costs data displayed on this page are provided by PrimeLocation to give an indication of potential running costs based on various data sources. PrimeLocation does not warrant or accept any responsibility for the accuracy or completeness of the property descriptions, related information or Running Costs data provided here.